POST UPDATE: There has been a great response from the original post! Many people have contacted me with their monarch experiences. The following nine new photos have been submitted! Thanks for sharing your photos everyone! 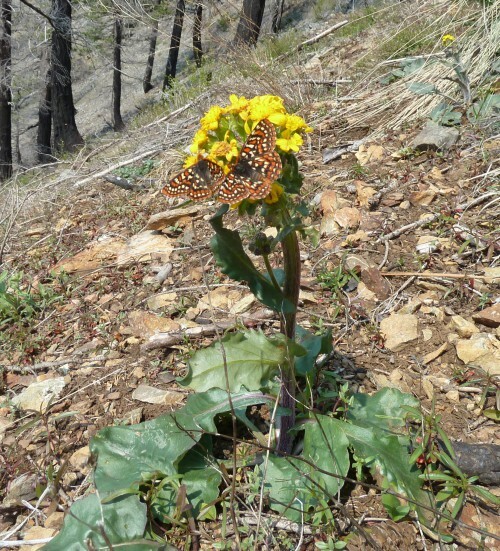 Monarch nectaring on mountain monardella (Monardella odoratissima) in the Siskiyou Mountains. Photo courtesy of Linda Kappen. Monarch nectaring on arrowleaf ragwort (Senecio triangularis) in the Siskiyou Mountains. Photo courtesy of Linda Kappen. Monarch flying off from narrowleaf milkweed (Asclepias fascicularis). Photo courtesy of Frank Lospalluto. Monarch nectaring on sneezeweed (Helenium bigelovii) on Grayback Mountain in Southern Oregon. Photo courtesy of Frank Lospalluto. 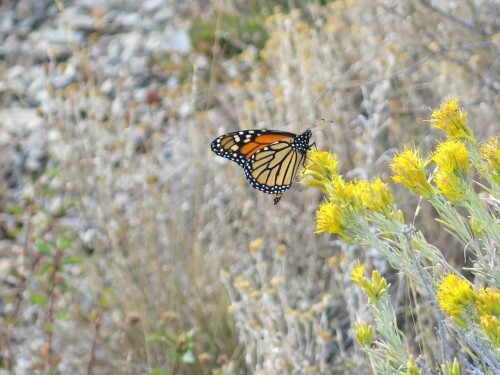 Monarch nectaring on rubber rabbitbrush (Ericameria nauseosa) along the Little Grayback Trail in the Upper Applegate Valley of southern Oregon on August 30, 2015. Photo courtesy of Jakob Shockey. Information on the specific species of native plants that the western population of monarch butterflies uses for nectar is not well known. 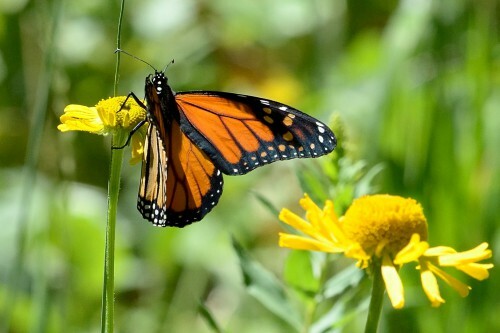 There are individual observations, photos, and generalized butterfly plant lists, but so far there isn’t a compilation of specific information on the use of monarch nectar plants. The Xerces Society is working on compiling a list of observed/documented monarch nectar plants for fourteen regions throughout the continental U.S. At the moment, Xeces says their most complete lists are for the eastern part of the country, but they have now started reaching out to folks on the west coast to get similar data for the western monarch population. 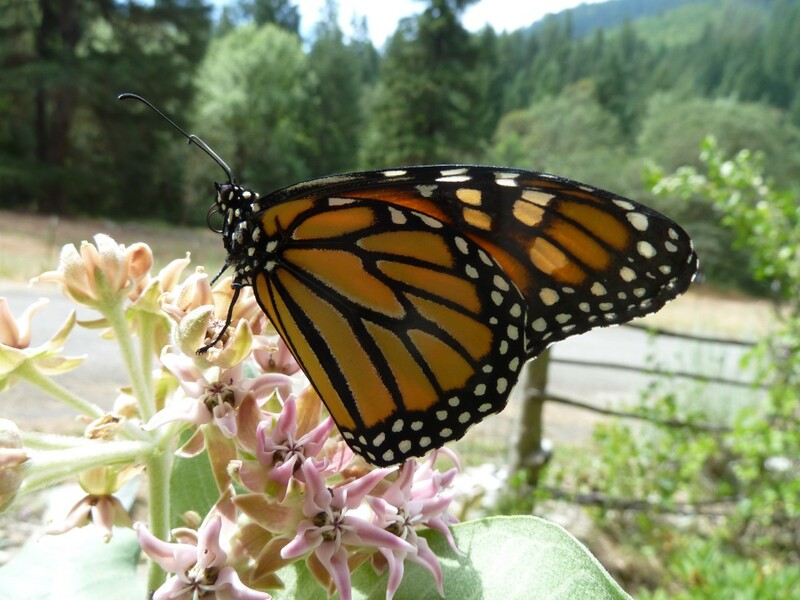 Due to the current dearth in information, Klamath-Siskiyou Native Seeds has made an initial attempt at compiling observed/documented monarch nectar plants native to the Klamath-Siskiyou bioregion of southern Oregon and northern California. This effort has been created through personal observation, observations by folks involved with Southern Oregon Monarch Advocates, extensive research to find photos, and correspondence with the Xerces Society, naturalists, botanists, native plant gardeners and fellow monarch enthusiasts. Monarch on Western coneflower (Rudbeckia occidentalis) in the Western Cascades, Oregon. Photo courtesy of Tanya Harvey. 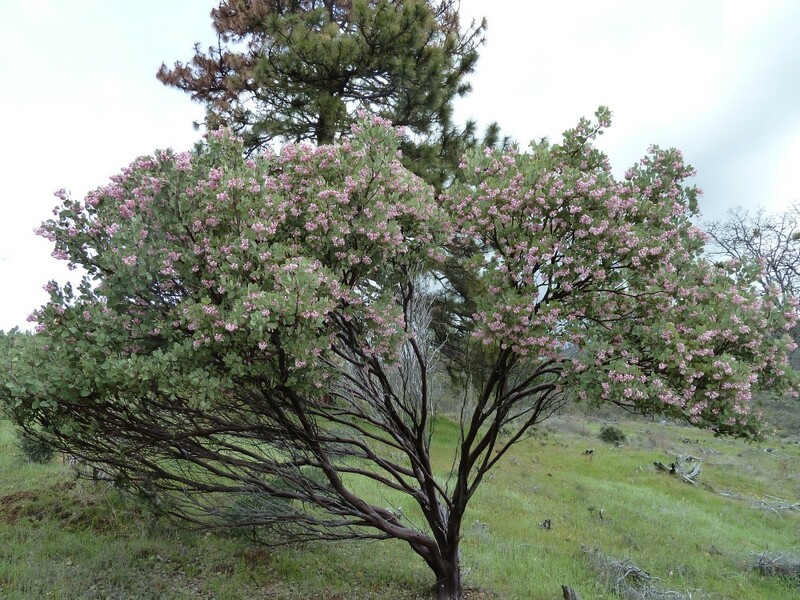 All plant species included in this blog post are native to the Klamath-Siskiyou bioregion. Many observations of monarchs using these plants have occurred outside the region, but it is a safe assumption, that if a monarch uses these species in a different part of the Western U.S., that it will also use the same species in the Klamath-Siskiyou as well. For this reason, we are including observations from outside this region as long as the plant is native here. 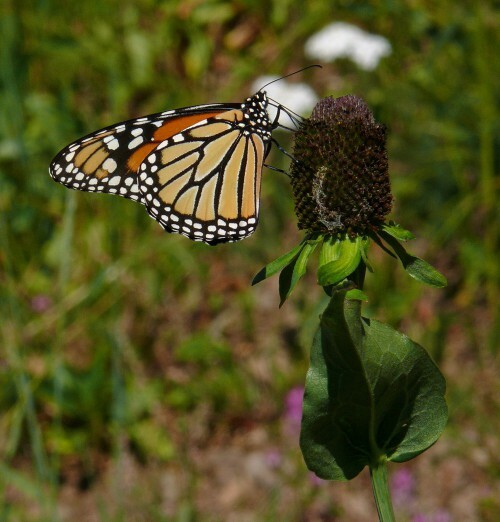 Please let Southern Oregon Monarch Advocates (SOMA) know if you have observed an adult monarch butterfly using a native plant as a nectar source. Help us expand this list and expand our understanding of the monarch’s habitat. Email me at klamathsiskiyou@gmail.com, or Tom Landis from SOMA, at tdlandis@aol.com, to give us your observations. We are compiling this list to help citizen science inform land managers regarding the conservation and restoration of monarch nectar sources. 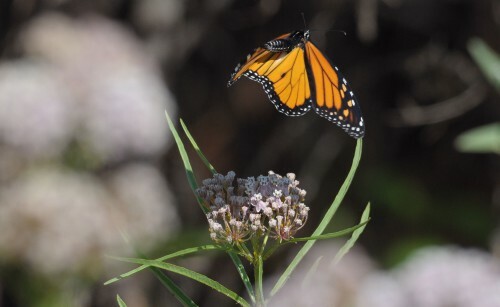 The list will also be used by backyard gardeners, schools, parks and other community groups to identify the best species to use for monarch butterfly plantings and “waystations.” Together we can help advocate for ecologically appropriate plantings with the most useful and beneficial native plants for monarch butterfly habitat restoration and waystations. 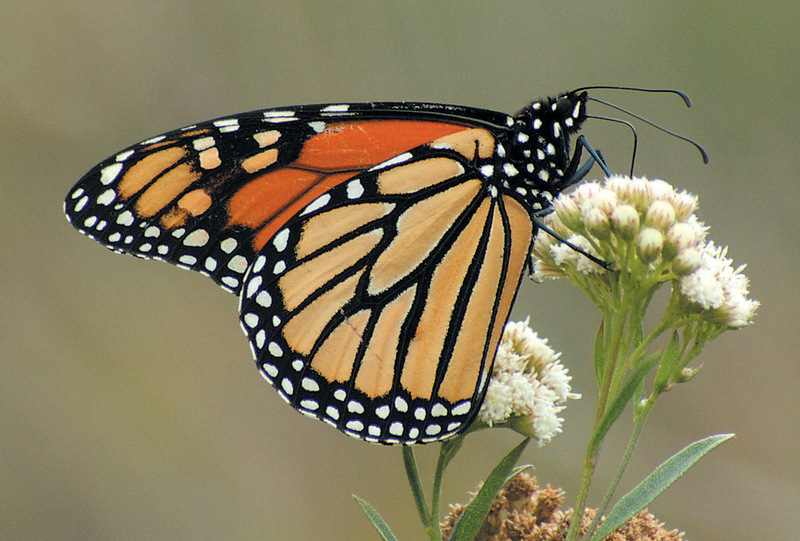 If you have a photo of a monarch nectaring on a native plant, please share, as that is the best way to document use. 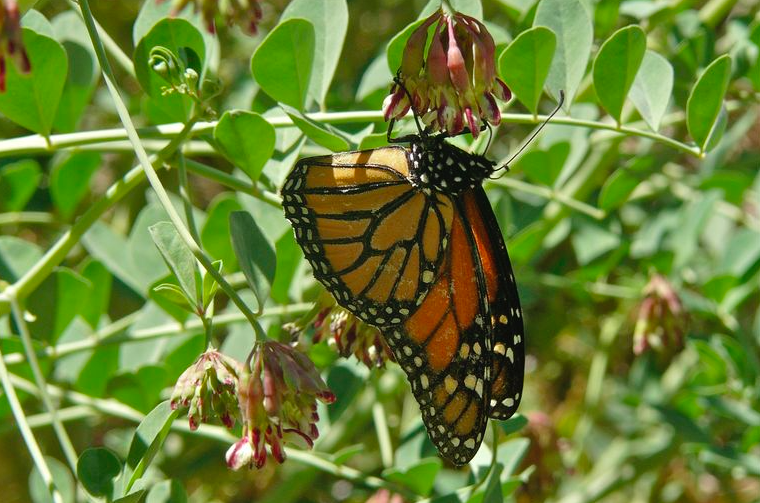 Check out the recent radio interview with folks from Southern Oregon Monarch Advocates (SOMA) on the Jefferson Exchange. Suzie, from Klamath-Siskiyou Native Seeds took part in the interview, along with Tom Landis from SOMA, and Linda Kappen from the Applegate School monarch project . Listen to the interview here. Pacific aster (Symphyotrichum chilense) This is a coastal species in southern Oregon and northern California. 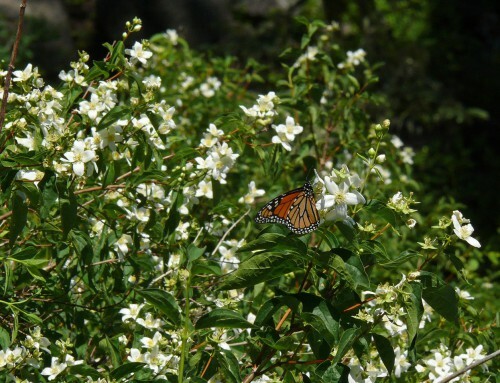 Observed as a monarch nectar plant by Jean Myers of Gilroy, CA. 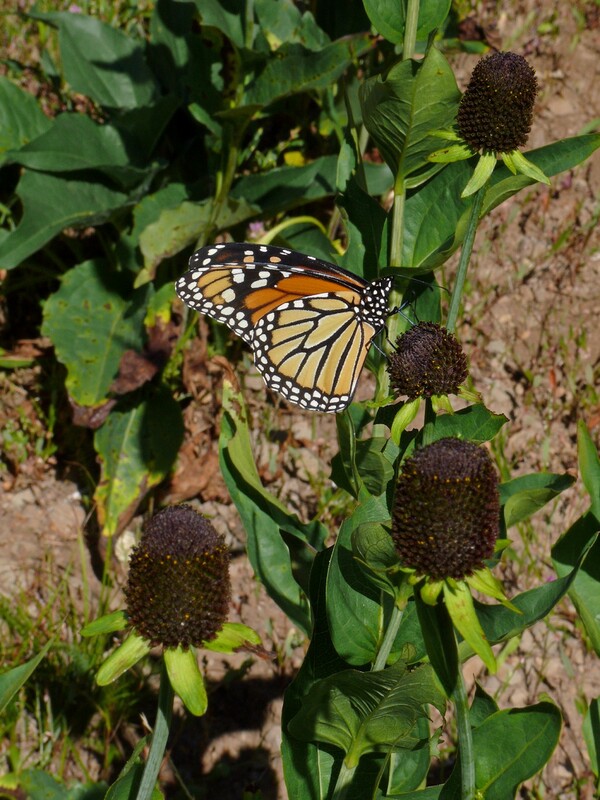 Photo courtesy of Jean Myers, www.casadosrios.net Las Pilitas Native Plant Nursery has also observed a monarch nectaring on this species. 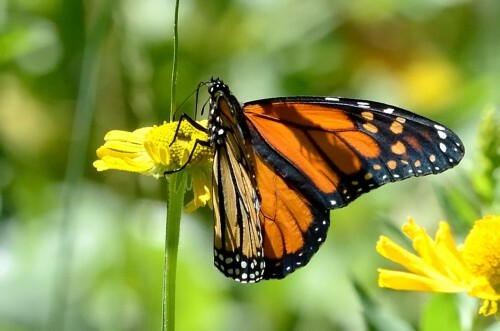 See their photo of a monarch on Pacific aster here. 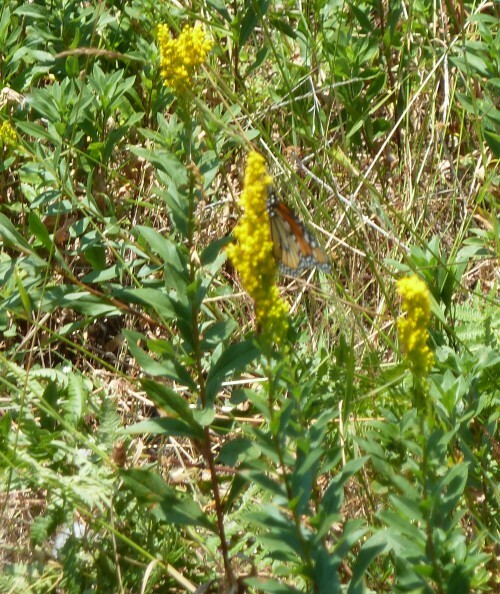 Monarch nectaring on West coast goldenrod (Solidago elongata) in a meadow on the Siskiyou Crest. Photo taken by Suzie of Klamath-Siskiyou Native Seeds. It’s not an easy task getting a photo of a nectaring monarch, as they usually fly off just as you approach. Blurred photos, like this one, are still great for documenting the use of nectar plants by monarchs. 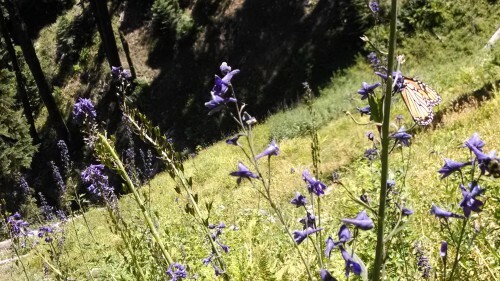 Monarch nectaring on Sierra or Western larkspur (Delphinium glaucum) on Mt. Ashland in Southern Oregon. 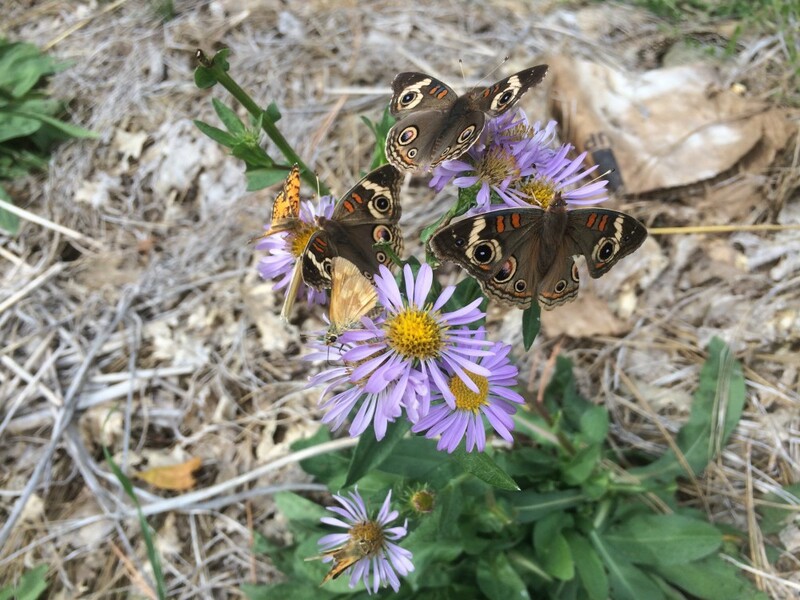 Photo courtesy of Hiram Towle, who, along with Steve Johnson from Southern Oregon Monarch Advocates, observed and documented this nectar plant use. 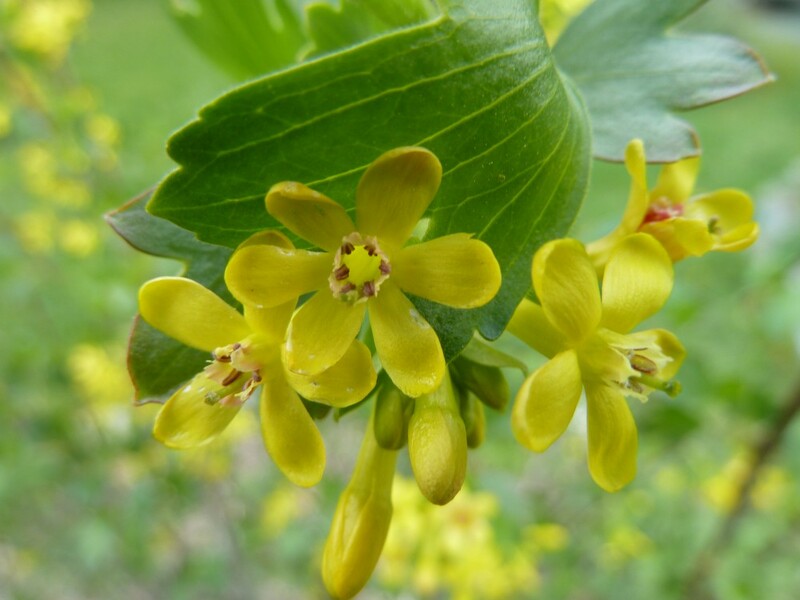 This species grows in moist, mountainous areas in the Klamath-Siskiyou. 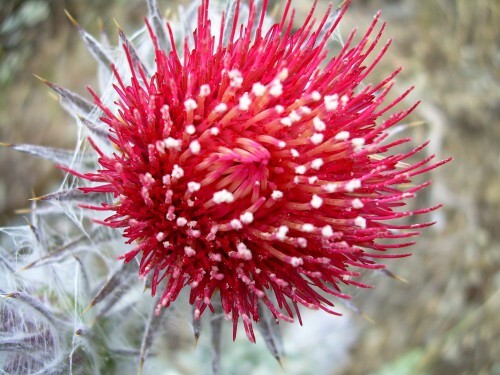 Below are photos taken by Klamath-Siskiyou Native Seeds. 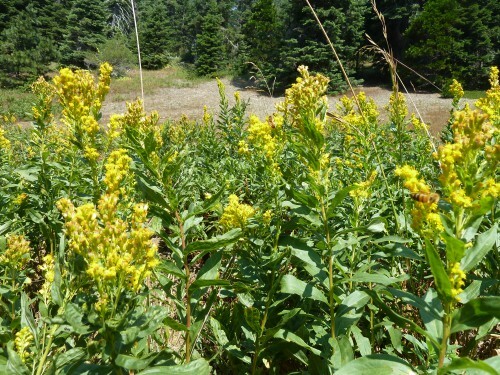 These plants are all native to this bioregion, and have all been observed as monarch nectar plants, but unfortunately, we just don’t have a monarch in all the photos…yet! Observations of monarchs using the native plant species below are included in the photo captions. Oregon false goldenaster (Heterotheca oregona) was observed by Kristi Mergenthaler as a monarch nectar plant, but I don’t have a photo to share for this observation. 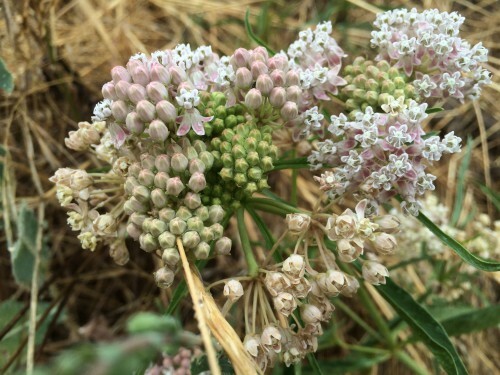 Milkweeds are shown at the end. It appears to me, that even when a monarch is presented with multiple choices for nectar plants, if there is milkweed growing in the area, it prefers to nectar on the milkweed. 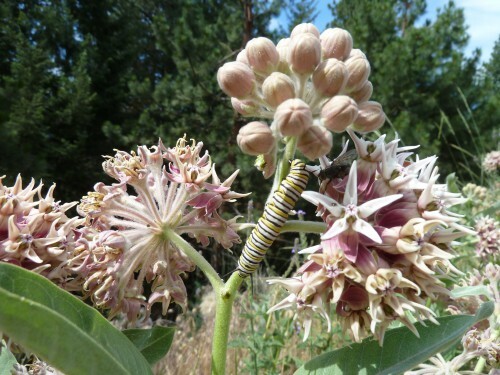 Milkweed is not only the exclusive larval host plant for the monarch, it is also a preferred nectar plant for the adult butterfly. 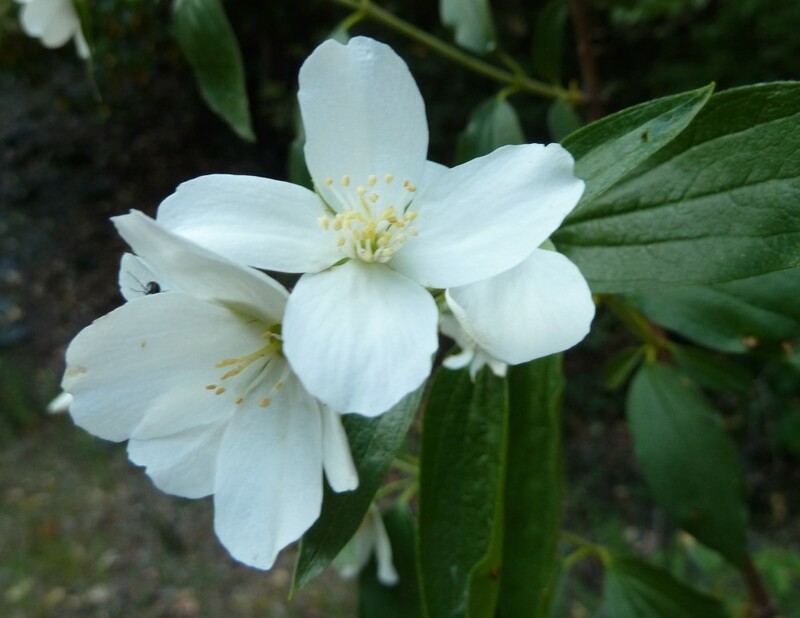 Mock orange (Philadelphus lewisii) A common shrub in the Klamath-Siskiyou region, and well-loved by pollinators. Observed as a monarch nectar plant by Tanya Harvey in the Western Cascade Mountains of Oregon. 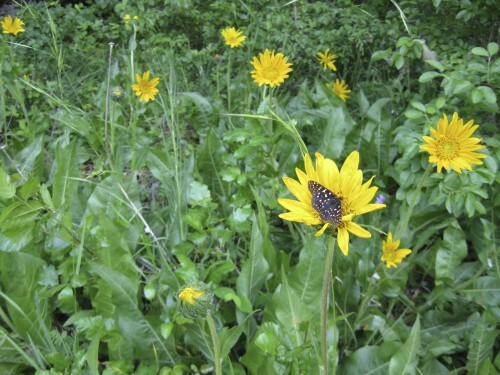 Mule’s ears (Wyethia angustifolia) Found in sunny, dry meadows and on dry, sunny slopes. Observed as a monarch nectar plant by Lori Humphrys in Buford Park, Lane County, Oregon. 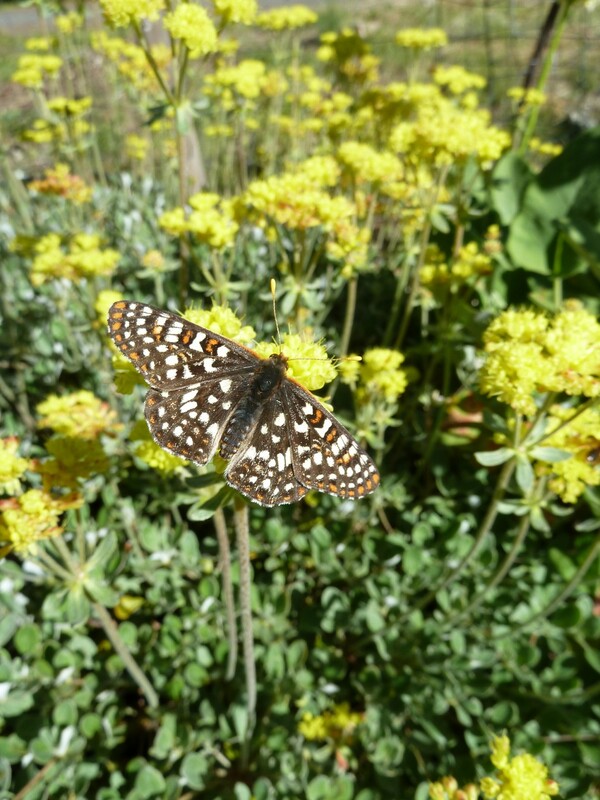 Checkerspot butterfly on sulphur flower buckwheat (Eriogonum umbellatum). 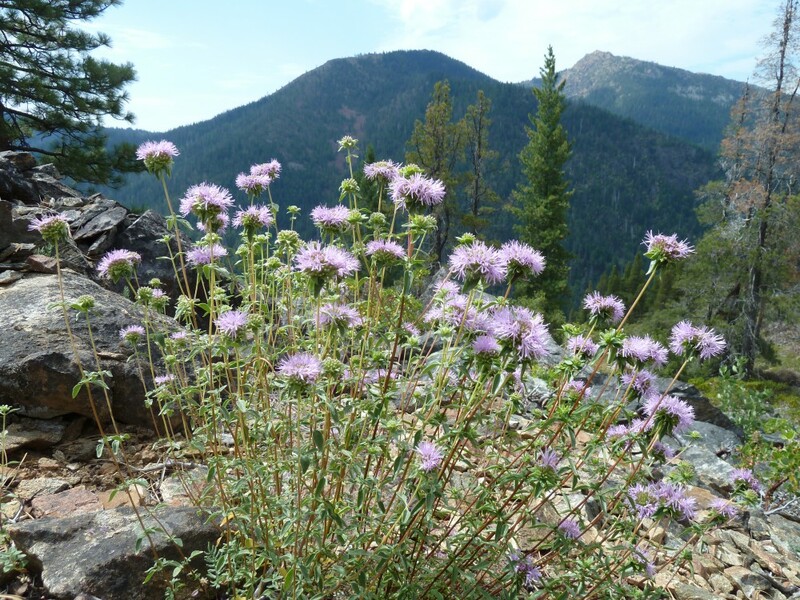 This is the most common wild buckwheat in the Klamath-Siskiyou Mountains. Observed as a monarch nectar plant by Suzie Savoie in the Upper Applegate Valley of Southern Oregon. Henderson’s aster (Symphyotrichum hendersonii) Found in moist, high elevation meadows. Observed as a monarch nectar plant in a garden setting by Luke Ruediger in the Upper Applegate Valley of Southern Oregon. 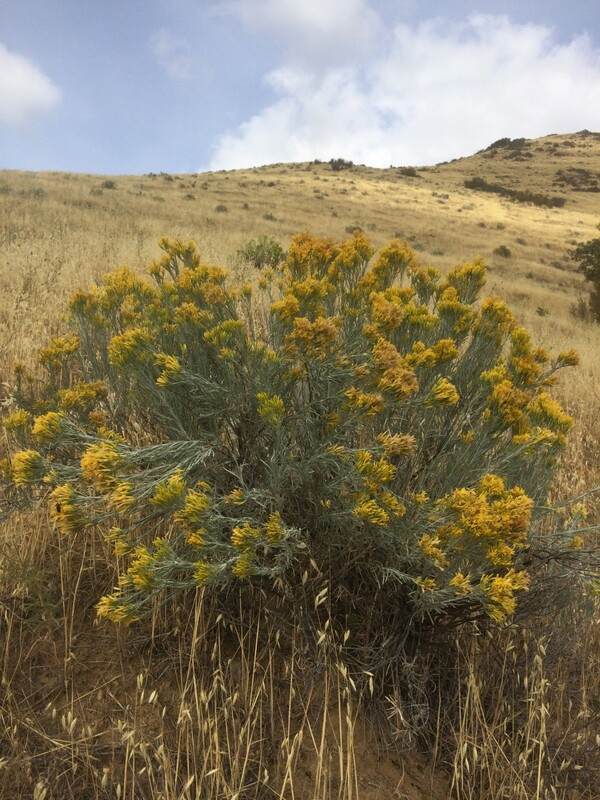 Rubber rabbitbrush (Ericameria nauseosa) Found on dry, exposed sites in the Klamath-Siskiyou. An important late season nectar plant. 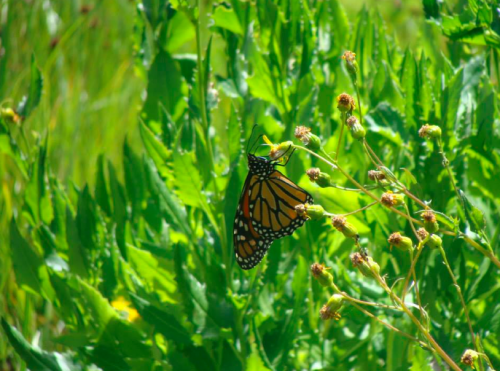 Observed as a monarch nectar plant by Kristi Mergenthaler in Southern Oregon. 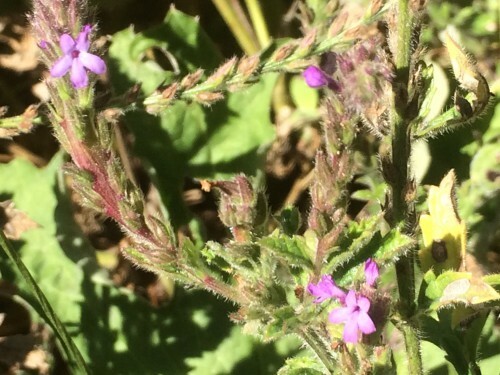 Western verbena (Verbena lasiostachys) Found in dry, disturbed sites. 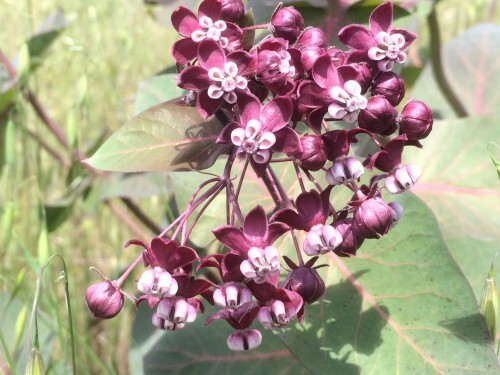 This plant is an undervalued native plant and great nectar source, found growing in disturbed areas, such as roadsides, that are too harsh for many other native plants. 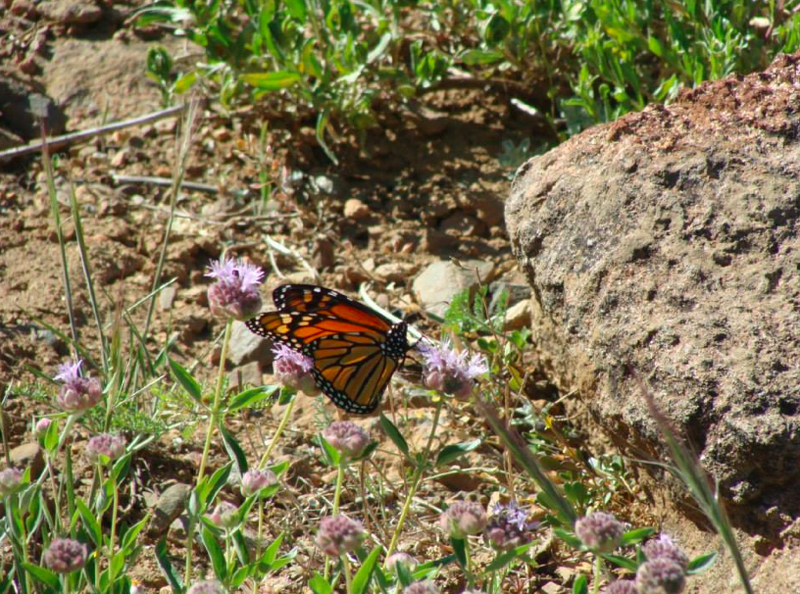 Steve Johnson observed a monarch nectaring on western verbena on Point Mountain in Southern Oregon. 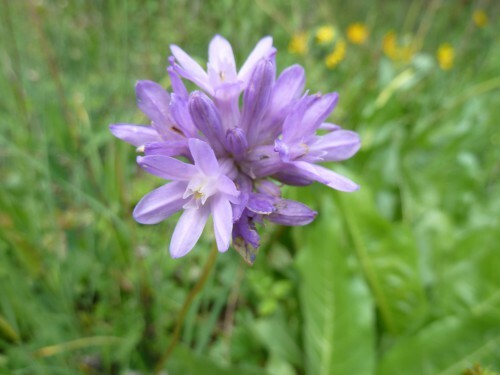 Ookow (Dichelostemma congestum) Observed as a monarch nectar plant by Kristi Mergenthaler in Southern Oregon. Check out this photo of a monarch nectaring on blue dicks (Dichelostemma capitatum). 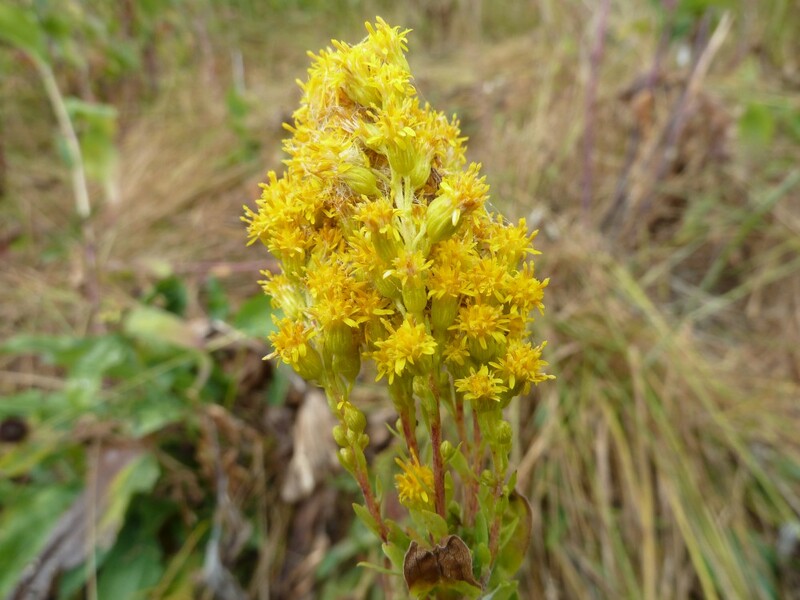 West coast goldenrod (Solidago elongata) grows in abundance in meadows in the Klamath-Siskiyou Mountains. This is an important, late season nectar plant for the monarch butterfly as it makes its way south through the mountains on its way back to its overwintering grounds. 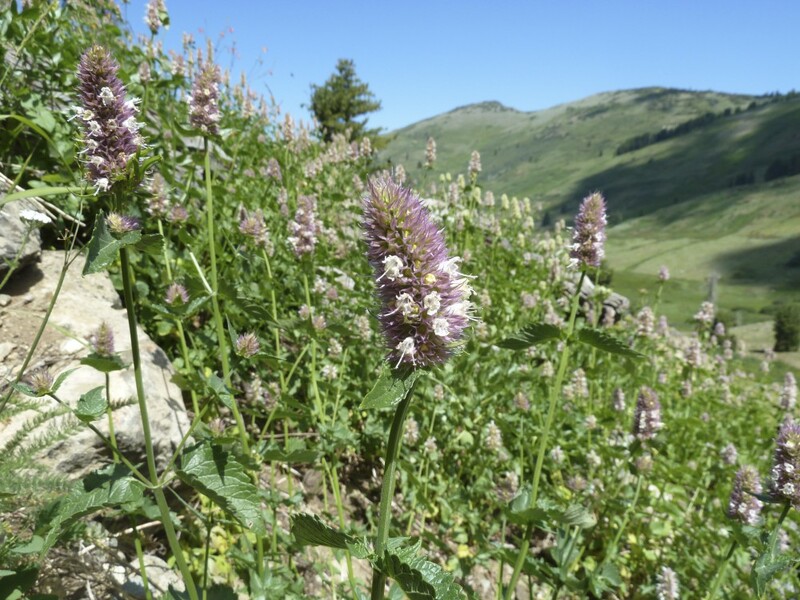 Horsemint (Agastache urticifolia) A high country meadow plant, growing in abundance in many mountainous regions. 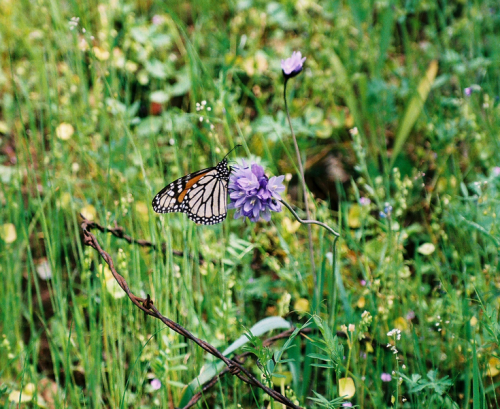 Observed as a monarch nectar plant by Luke Ruediger and Kristi Merganthaler in Southern Oregon. Western thistle (Cirsium occidentale) Grows in dry, sunny locations in the foothills. 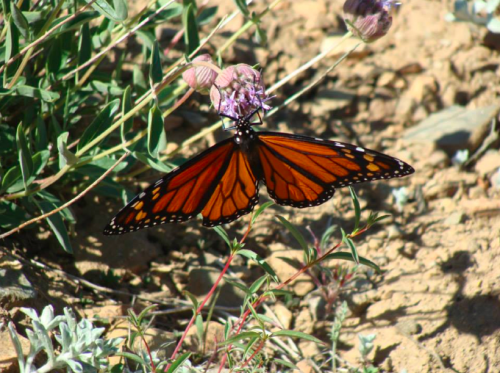 Observed as a monarch nectar plant by Las Pilitas Native Plant Nursery in California. 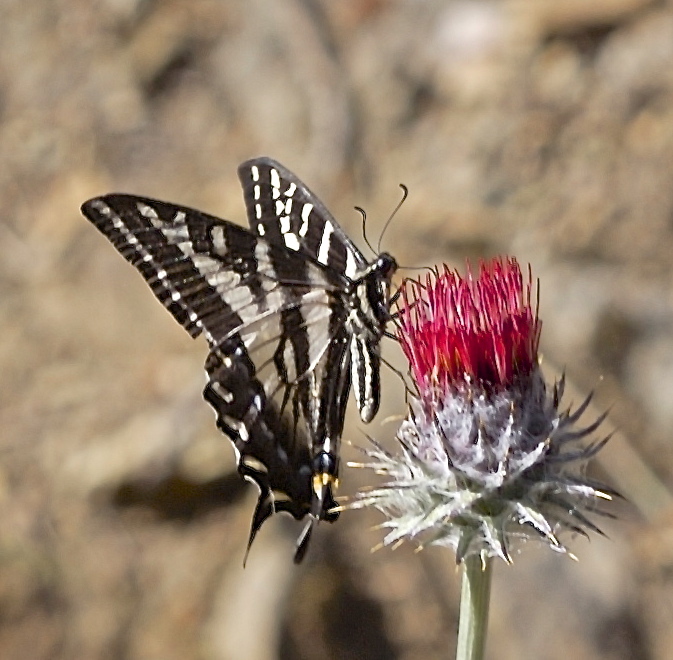 See their photo of monarch on Cirsium occidentale here. Groundsel (Senecio integerrimus var. exaltatus) on the slopes above the Klamath River. 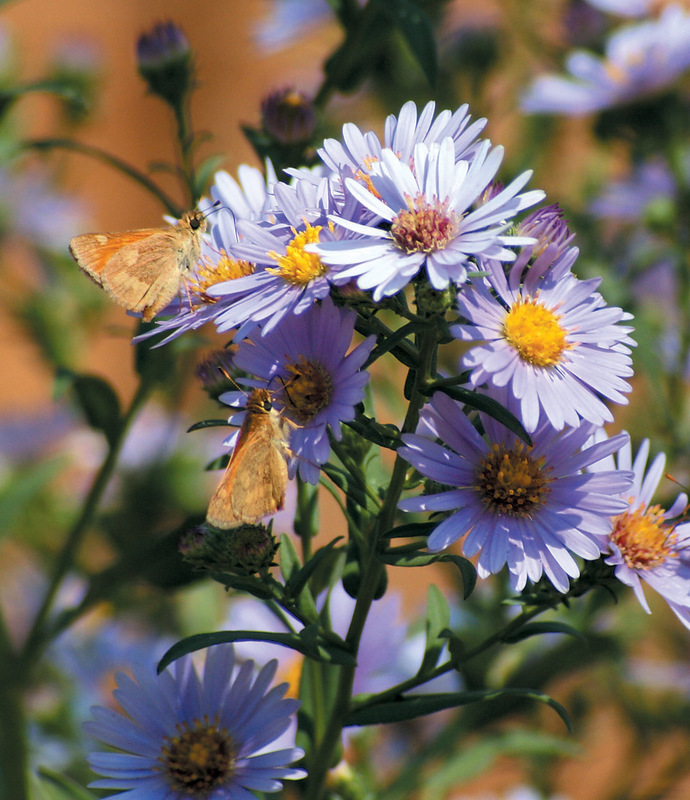 Butterflies love nectaring on plants in the genus Senecio. 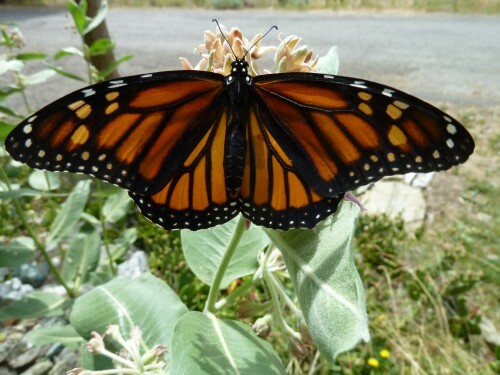 Linda Kappen observed a monarch nectaring on Senecio triangularis on the Siskiyou Crest. Chokecherry (Prunus virginiana var. 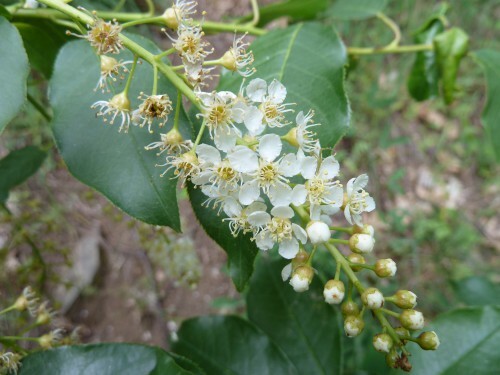 demissa) Las Pilitas Native Plant Nursery has observed a closely related variation of this same species of chokecherry, Prunus virginiana var. melanocarpa, as a nectar source for monarch butterflies. See their photo here. Mountain monardella (Monardella odoratissima) A lover of dry, exposed, rocky areas. Observed as a monarch nectar plant by Kristi Merganthaler, Linda Kappen, Suzie Savoie and others in Southern Oregon.